British Medical Journal (BMJ) India has conducted its second BMJ Conclave, in the city this year, through two concurrent and separate tracks: Improving Healthcare Quality and Evolving Trends in Librarianship in India. This conference was organized to help build the momentum around evidence based medicine and clinical decision support tools, the BMJ spokesperson here said. The objective of conducting this event was to debate and discuss how to improve health care quality across academic institutions, hospitals and other centers providing clinical care. The Healthcare Quality track was inaugurated by Prof Dr. Krishnangshu Ray, State Director, Institute of Health and Family Welfare and chaired by Prof. Dr. Pradip Mitra, Officer on Special Duty, State Department of Health and Family Welfare and vice president, IMA Bengal Dr Sanjeev Singh on Saturday last. Medical Superintendent Amrita School of Medicine, Kochi was the speaker for the technical session.The event was attended by many doctors across Kolkata from medical institutions and hospitals of repute. Speaking on the occasion Prof. Dr. Ray said, “Health information technology has ushered a new frontier of quality health care in the name of Clinical Decision Support Systems (CDSS). Delegates, speakers, and dignitaries appreciated the utility and importance of BMJ Best Practice, a clinical decision support tool presented by BMJ and demonstrated at the conference. The theme for the library session was Evolving Trends in Librarianship in India. This session focused on the evolving roles of libraries in acting as the gateway to scholarly publication and the role and the scope of digital libraries amongst many other topics. The library track was inaugurated by Dr. K.P Singh, Director, National Medical Library, Directorate General of Health Services, Ministry of Health & Family Welfare. The speakers for the library event were Ms. Vasumathi Sriganesh, Founder, QMed Knowledge Foundation, Mumbai and former librarian at Hinduja Hospital and Dr. Avinash D. Chinchure, Scientific Officer, Tata Institute of Fundamental Research, Bangalore. Dr Singh was also conferred the Medical Library Leadership Award for his numerous contributions to the ERMED consortium. The resources available through ERMED and National Medical Library (NML) are an immensely valuable knowledge trove for healthcare professionals, researchers and academia. The National Medical Library is an attached office of Directorate General of Health Services (DGHS), Union Ministry of Health and Family Welfare (MOH & FW). 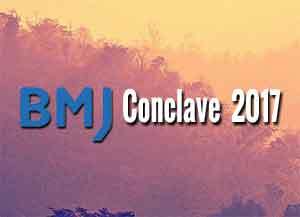 Through BMJ Conclave, BMJ endeavored to present a platform that would help debate and discuss what efforts would be necessary to bring together an evidence-centric approach to clinical practice and reduce the incidence of medical errors. Through the parallel track for librarians, BMJ hoped to generate ideas on maximizing the benefits of access of e-resources within healthcare institutions.